Following the success obtained with the first electronic chess games, other strategic games were proposed in the 1980s. However, the success was not often achieved. 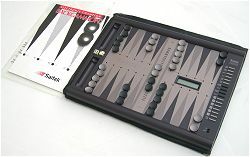 Bridge and Backgammon are often played in the world but they are least interesting without the human factor. 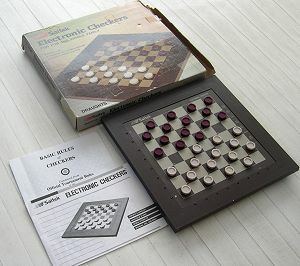 Checkers and Othello are not played at lot at a high level. So these small computers have no big value, even if they are very nice to discover or progress. 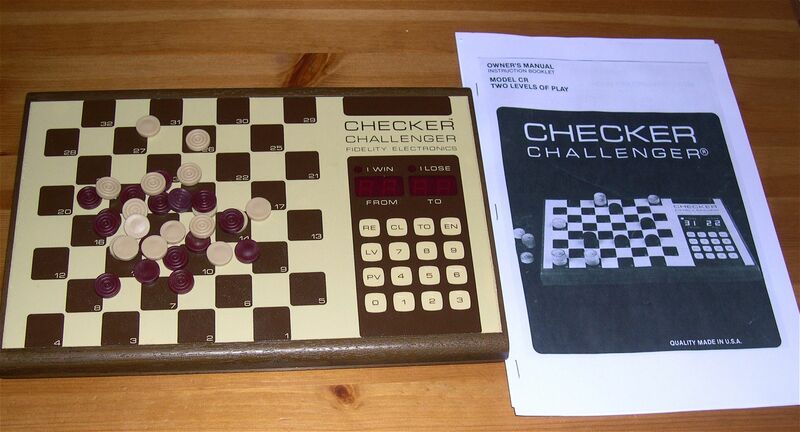 This game does not have the original checkers pieces that were in wood with magnets and the user manual is a copy. 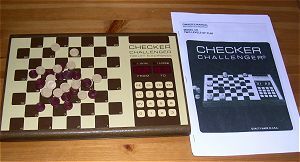 This Checker Challenger has only 2 levels of difficulty. 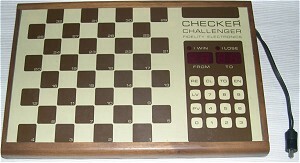 This is the second release of Checker Challenger, with 4 level of play and a stronger program. There is no more plastic film and this game is beautiful despite its age. The power adapter is 12V Alternative (!) and it's not easy to find one. I bought this game as it is on the picture. 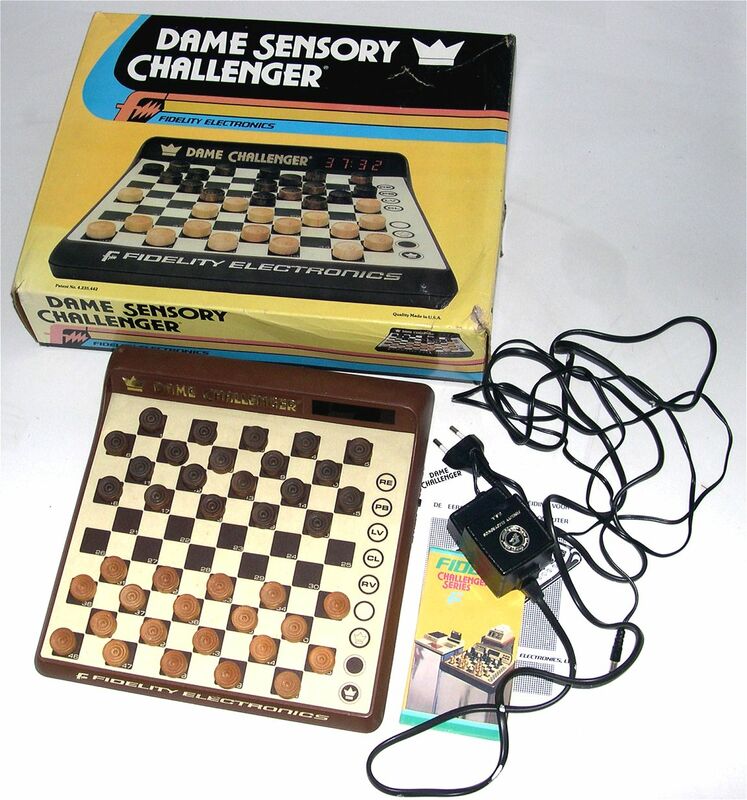 I later found a compatible power adapter and plastic checkers to play (and lose) some games. 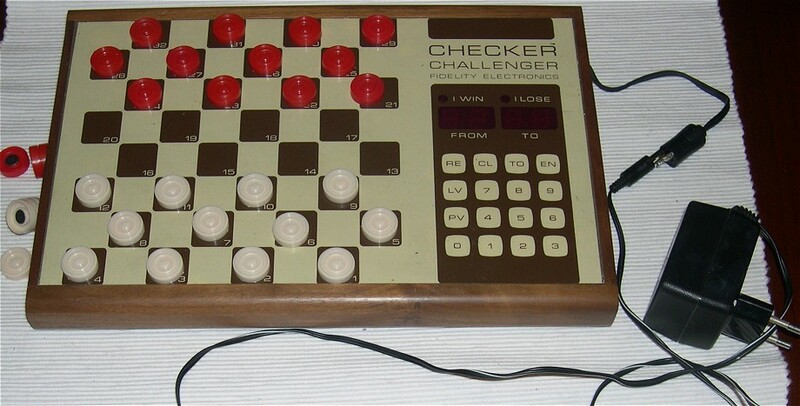 I also found some nice wooden checkers but they were not magnetized. This Backgammon Challenger is old and very simple: There is only one game level. It's possible as an option to use real dice to play. This device comes from the USA: you can see it with the plug. 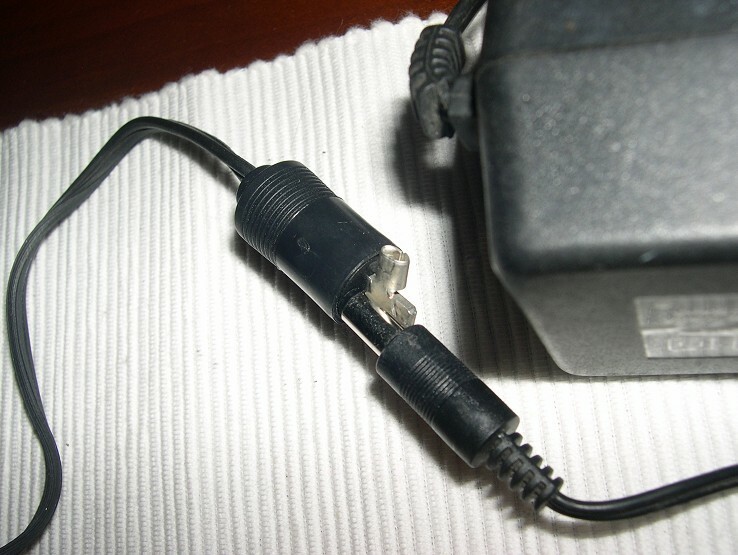 I never modified the power adaptor for France because it works well with any kind of standard 9V adaptor. The dice given with the game are really small and not usable. There are small magnets under the pieces. 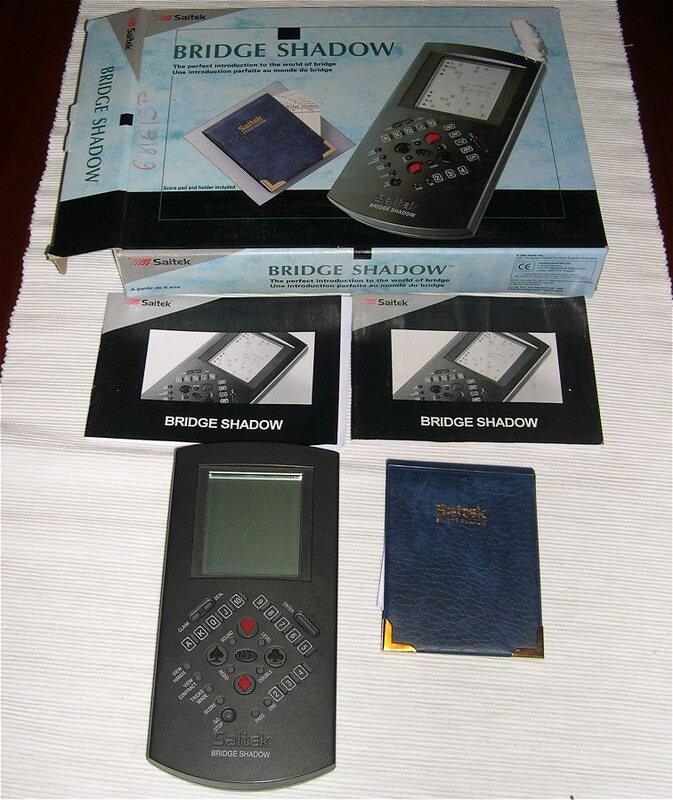 This Advanced Bridge Challenger is a sophisticated machine using specific playing cards markings and a bar code reader left to the keyboard. So can we distribute "as a blind" cards to the machine. These cards are then properly sorted on the green baize and the machine will use a number to indicate which card he wants to play. The first "Bridge challenger" had some minor bugs fixed in the advanced release. There was also a Voice release that was speaking but had the same program. This device comes from the USA. It's clearly visible on the power adaptor. This power adaptor outputs an alternative 9V (not easy to find on the market). So I just added a US-Europe converter (110/220) from Tandy . 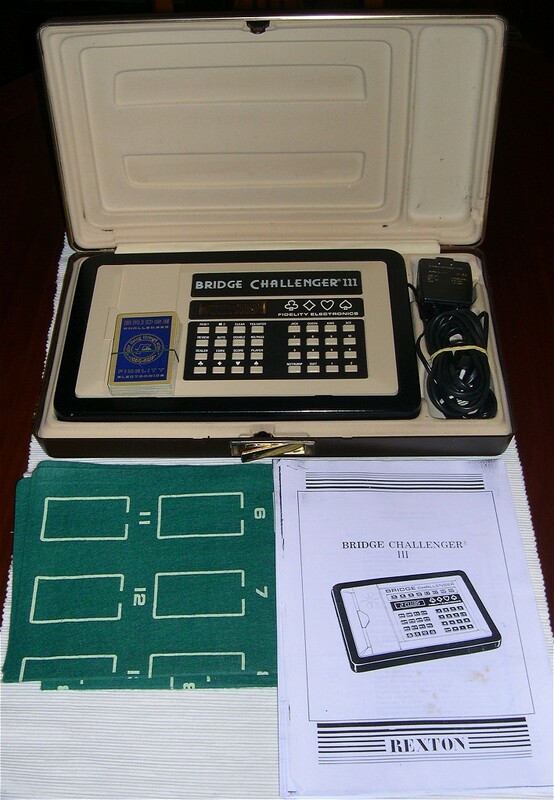 The Bridge Challenger was from 1980, the Bridge Challenger II from 1981 and the Bridge Challenger III from 1984. In the magazine Jeux et Stratégie n°29 was written: "Significant progress compared to the Bridge Challenger II. But we expected more after 3 years.". 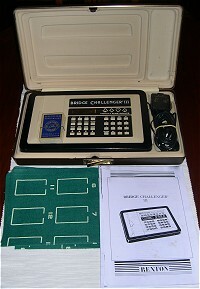 This Bridge Challenger III is a French release, distributed by Rexton. 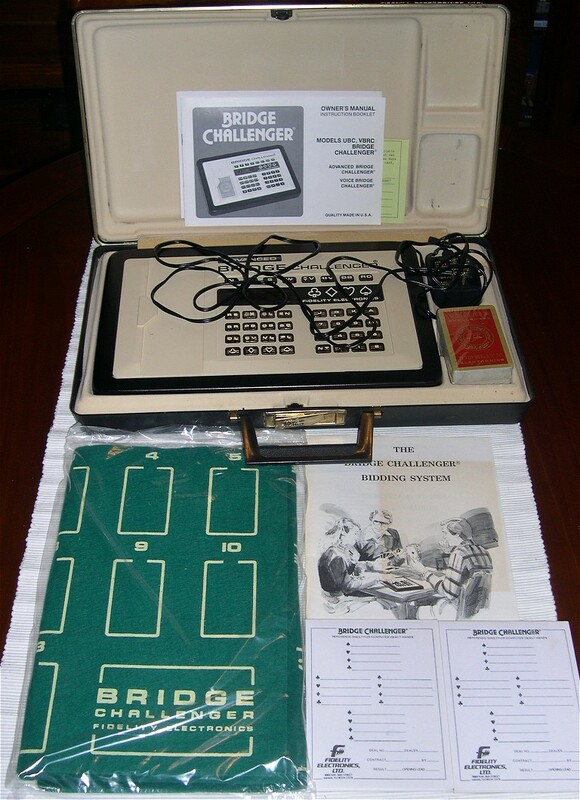 The Gin & Cribbage Challenger is a game that looks like the Bridge Challenger. 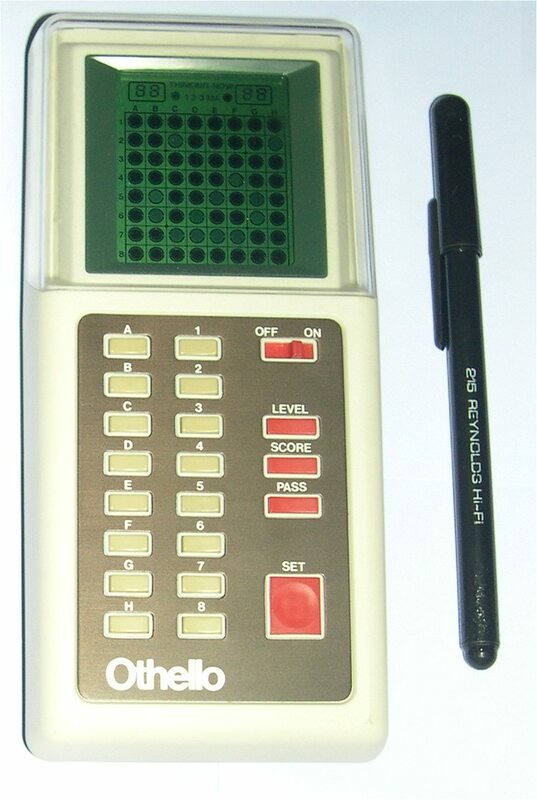 It's a rare electronic game able to play Gin Rummy and Cribbage. I tested the Gin Rummy with this electronic game. It's very nice to use real playing cards. 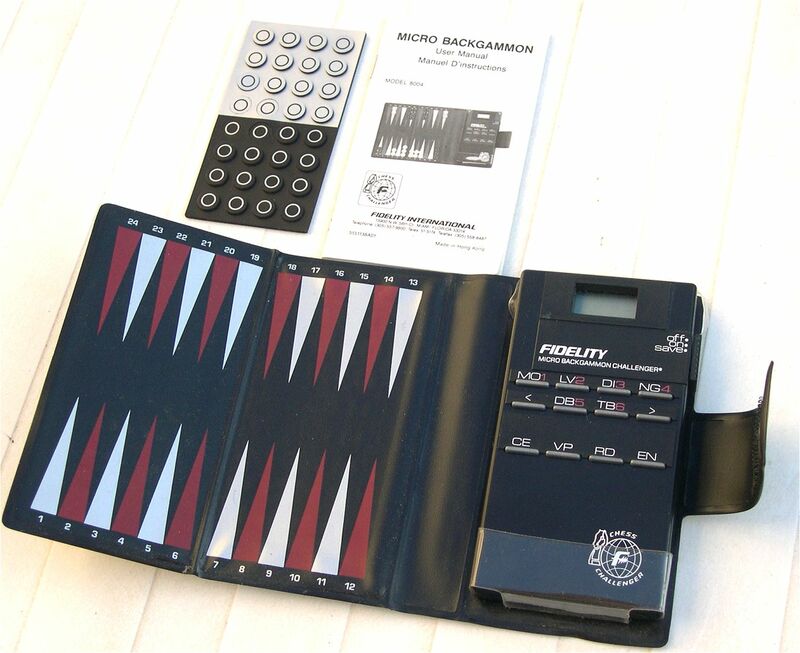 The opponent cards are hidden and identified by a bar code reader. But I think it is a quite weak player because it used to knock a bit to fast, without trying enough to reach the gin. 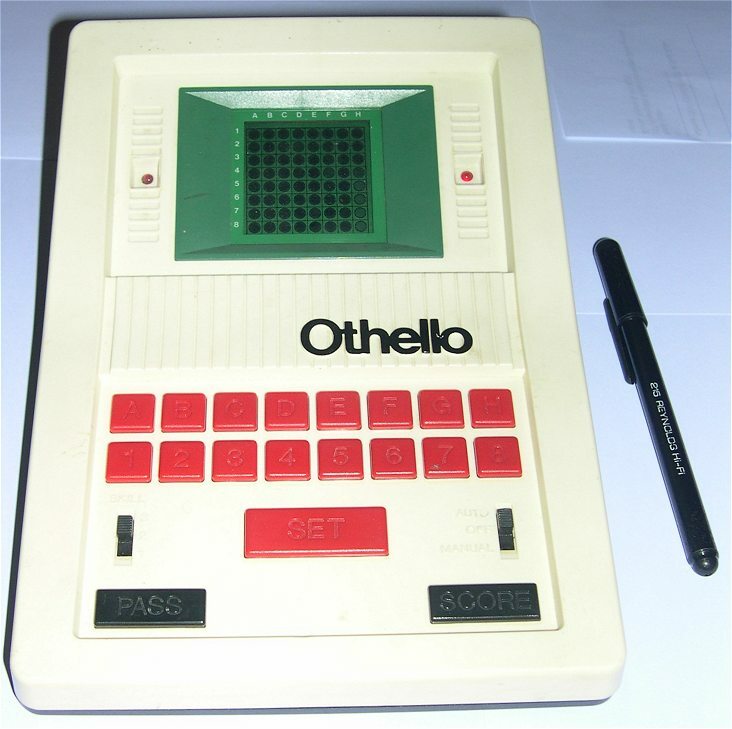 The French company Dujardin imported at least two Othello games produced in Japan by Tsukuda: Electronic Computer Othello from 1980 is of large size. 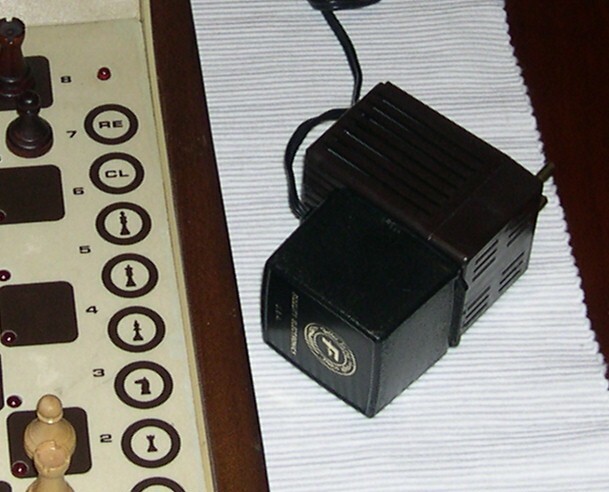 M-II, from 1981, is smaller. Both programmes are probably similar, with 3 weak levels of game. 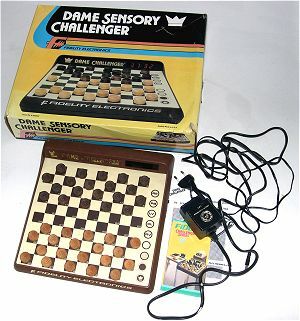 The Dame Sensory Challenger (1981) is playing draughts following the international rules on a 10x10 board. There are a lot of variants for the game of draughts. This one is called international draughts and is played a lot in France, Belgium, Holland, some Eastern Europe and African countries. 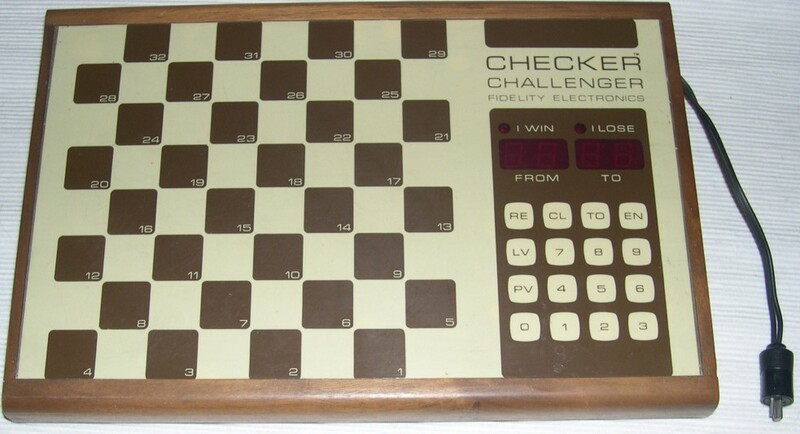 In England and USA, people are more interested by Checkers/Draughts on a 8x8 board. For more information, see wikipedia. This game is nice, easy to use and tactically good. But it is missing long term view and will not resist to good club players. 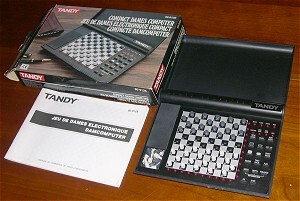 There are several software playing international draughts on PC. 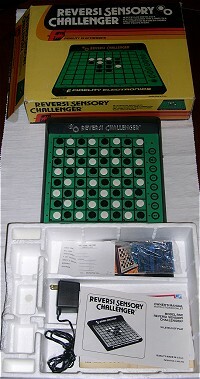 Reversi Sensory Challenger is a very good Othello / Reversi player and a beautiful machine. 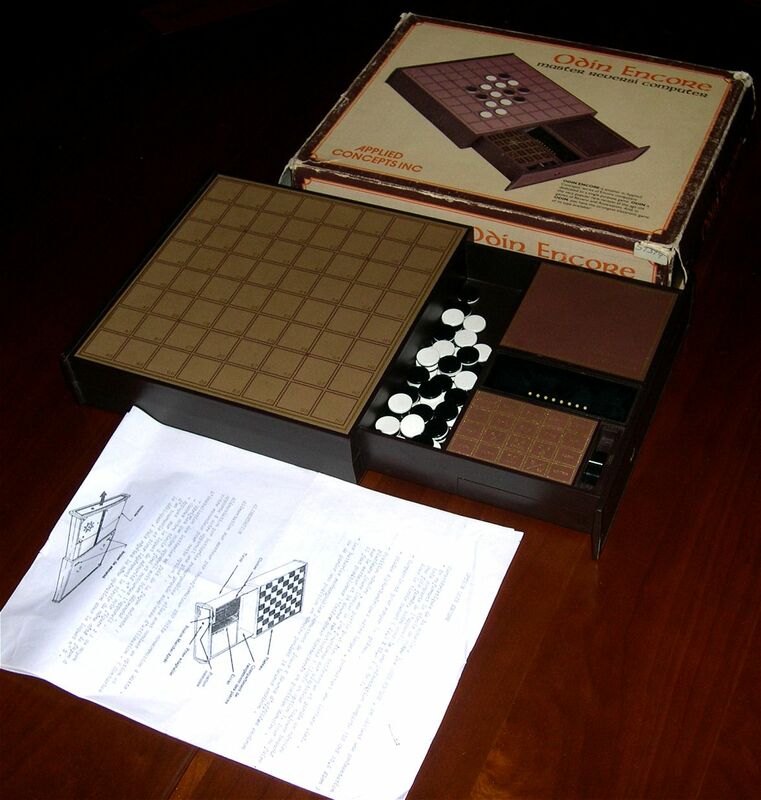 The competitor "Odin" was sold in the great game machine and it was necessary to enter the coordinates of each move. Here, you simply have to push the square. This device is unique, without equivalence today. This game allows the Reversi starting position (white and black face to face). This one is in a US package (well working in Europe). The French release has a different package. Here is a test game. 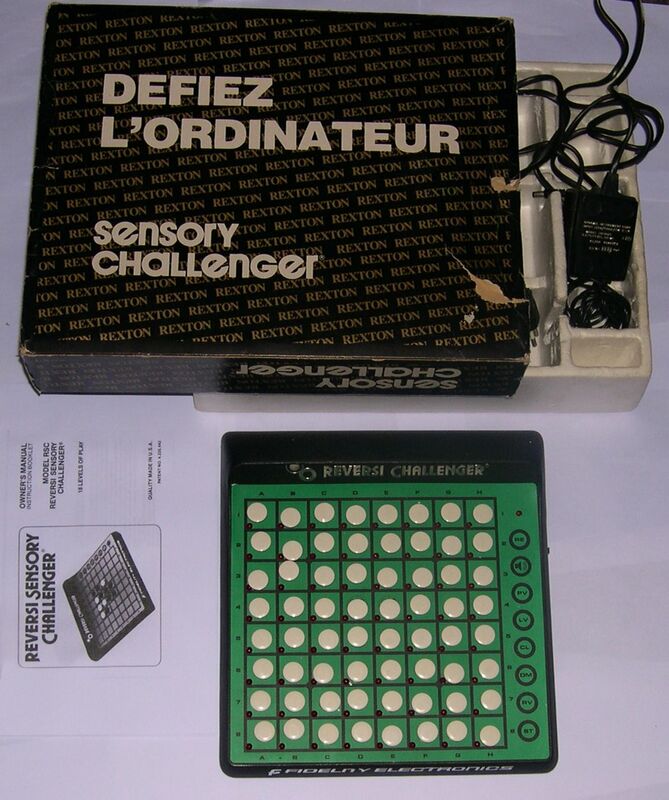 In the number 12 of Jeux et Stratégie (1982), there was an article on Odin and Reversy Sensory Challenger: their superior level is certainly above the possibilities of the best French players. These machine have an opening library and play perfectly the final part, around 10 move in advance for the best levels. They seems too know the tactical tricks, including side resolution and the final part of the game. Odin is an Othello software distributed as a Great Game Machine module under the name "Odin Edition" and as a dedicated machine under the name "Odin Encore". The two modules have a small difference: Odin Edition has a 8th "turnier" level . Odin Encore only has 7 levels not well balanced. The level 4 is using between 30 s and 1 mn per move. The level 5 is using between 5 and 10 minutes per move. Odin has a small display usable for instance to check a position. Except that, it has less functionalities than the Reversi Sensory Challenger. For instance: the moves are entered by the keyboard. The takeback function is limited to 16 half moves. It's a very good othello software. To my mind, it is a bit better than the Reversi Sensory. I have a quite good Othello level and I played several test games including a victory at level 4 and a victory at level 5. 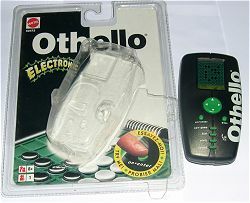 This Mattel Othello is a little gadget. It is pretty and very nice to use. But its game level is weak. You can see on the picture the result of a game played at level 3 (maximum). I won 51 to 13. 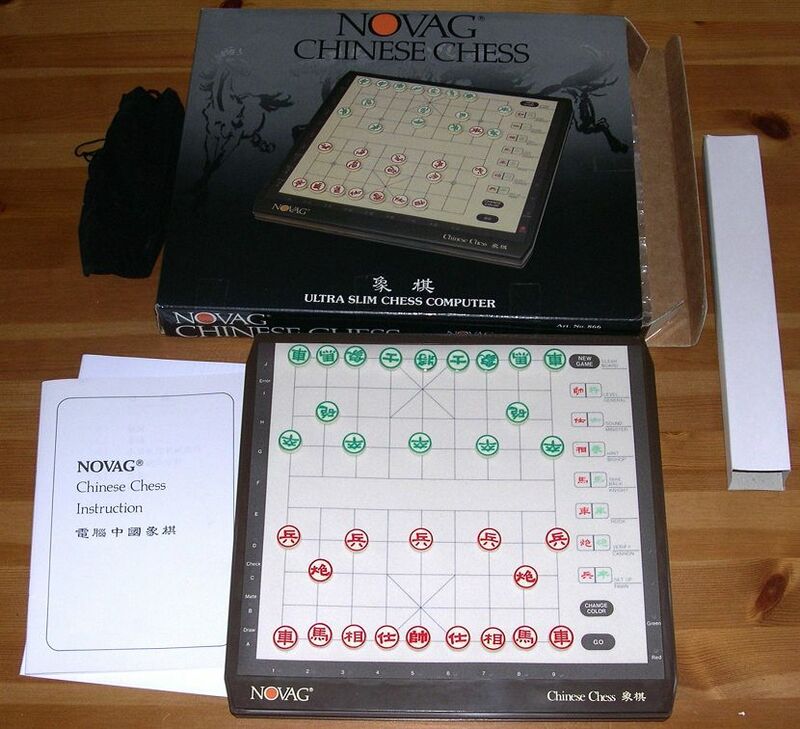 Novag distributed several computers playing Xiang Qi. This model is numbered 866 copyrighted 1986. There will be later other models including the 9300 (that looks similar to the 866), 9301 (a travel game), 9302 (a better software), et 9303 (another travel game). You can see these computers on the net but they are no more available in stores. 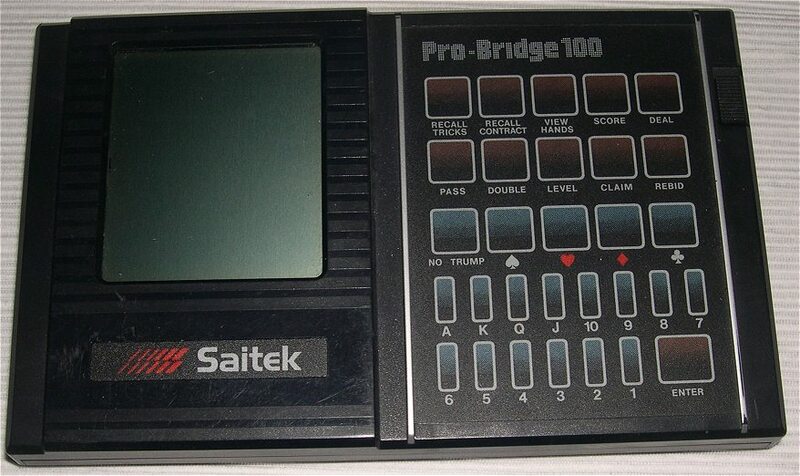 The Pro-Bridge 100 Was the first Bridge computer published by Saitek. The cost was 800F (around 160 US$) in 1987 (but I do not have the manual). Since that day, Saitek have been distributed several enhanced computers. 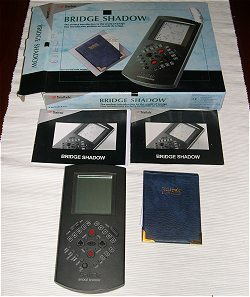 The Pro Bridge 200 from 1989 (3.58MHz, 16Kb) and the Bridge Shadow from 1992 (3.52 MHz) are identical models outside the external design. 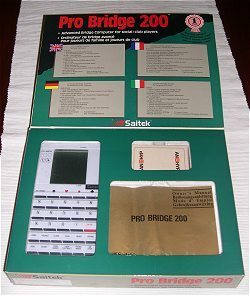 The last Saitek Bridge computers are the Pro Bridge 310, 311, 610 and a special computer for training: Pro Bridge professor. The Saitek Pocket Checkers is from 1988. This game is a european release with a user manual in 4 languages: English, Italian, French and Spanish. At that time and during some years, Saitek tried to sell backgammon, checkers and dames games but with poor commercial success. These games are rare to find. The Tandy Electronic Checkers has a design similar to the Saitek Kasparov Pocket Chess. 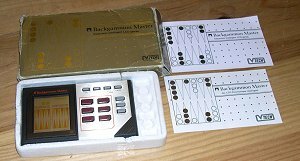 I do not have the user manual but it's very simple: 8 level of game, a take back function, a non auto mode to enter a set of moves. 6 double height checkers are given for each colour. 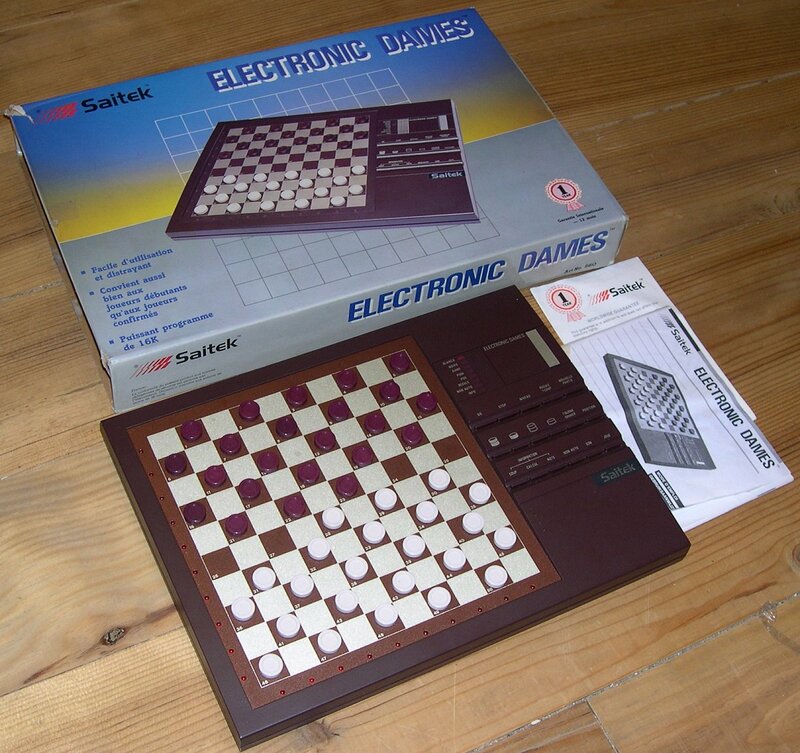 The Saitek Electronic Checkers is a quite rare game. 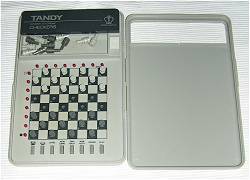 It is probably very similar to the Tandy Electronic Checkers (and the Saitek Pocket Checkers) because it has also 8 levels of game and similar functionalities. This software used 5Kb of memory. At the highest level, it plays at 5 minutes per move. The Saitek Electronic Dames plays French dames 10x10. In Jeux et Stratégie number 54 from 1988, it was written: Nice design. It's not the level of a good club player but it helps to progress. Blind program in the long term view. Good tactical level. Good price (800F). 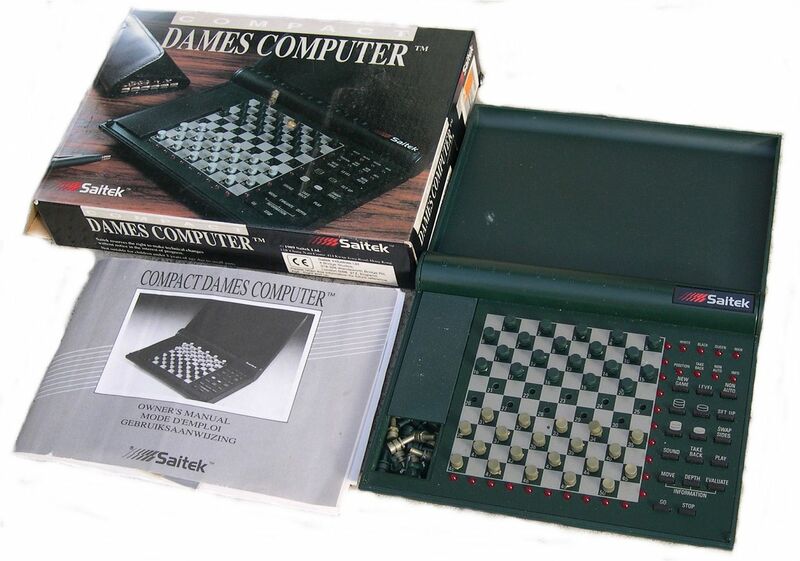 The Saitek Electronic Dames was also produced as accelerated at 12MHz. 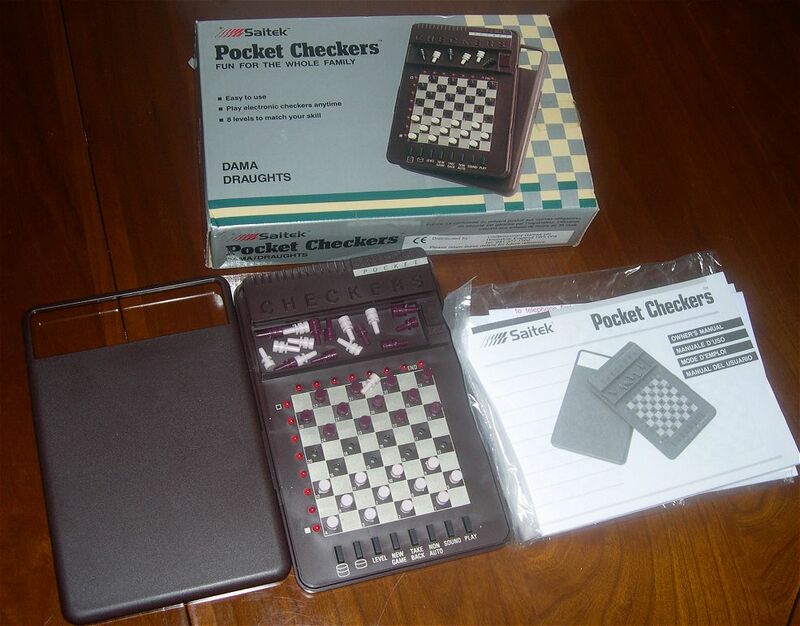 The first serie was at 8MHz and had a different design and purple checkers. Here is a copy of the French user manual. 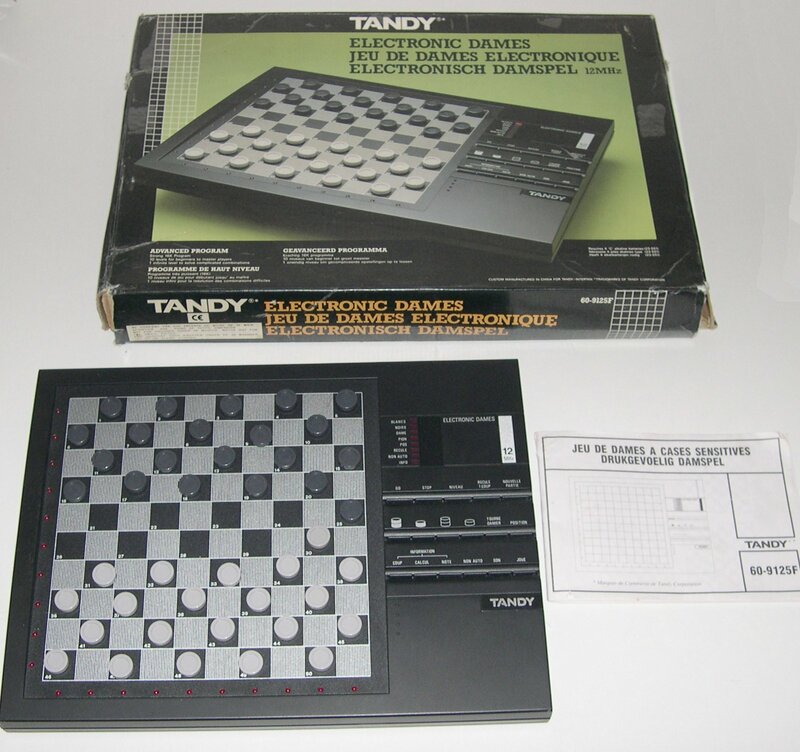 The Tandy Electronic Dames is identical to the Saitek Electronic dames. Only the Saitek logo is replaced by the Tandy one. Here it's again a 12MHz processor. The text on the game is in French. The user guide is in French and Dutch. The Saitek Compact Dames Computer is the travel design of the Saitek Dames. It plays French dames 10x10. It was published in 1990. It used the same processor: a 6301Y but it was a bit slower: 8MHz instead of 12. Here is a copy of the English user manual. The Tandy Compact Dames Computer Is of course identical to the one distributed by Saitek. It plays French dames 10x10. Here you have the European release of this game. 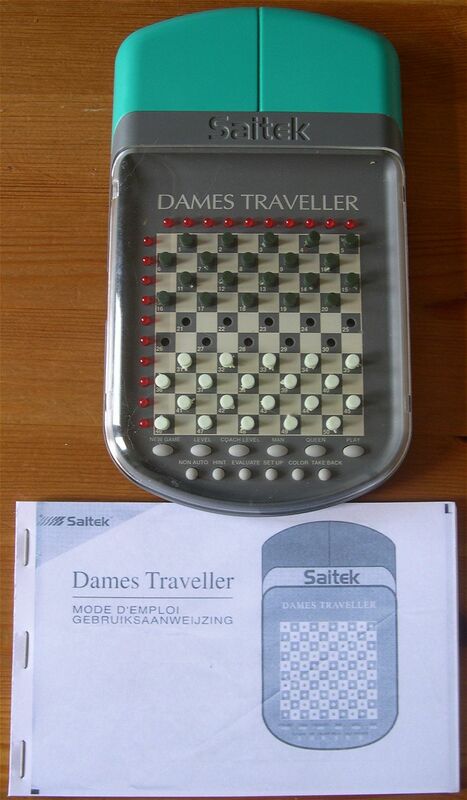 This Saitek Dames Traveller is from 1993 but it clearly includes the same 16Kb software as the Saitek Electronic Dames in a travel game. It also has 10 game levels including 1 for analyse. A small difference in the user manual: the processor speed is written as 2MHz and it was 12 in the Saitek Electronic Dames. However, it's probably a printing mistake. 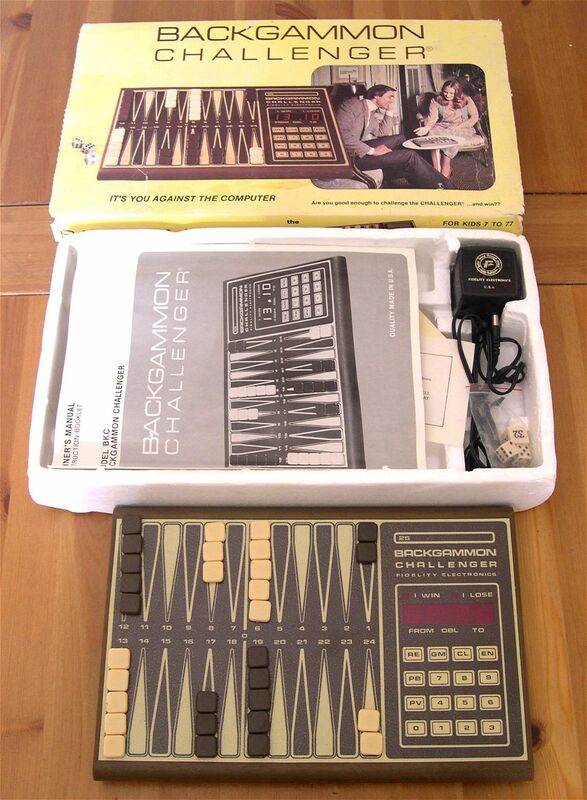 This Fidelity Micro Backgammon Challenger looks like the Fidelity Micro Chess Challenger.. It has a very compact design but it also has a weak game strength. The user manual is in French and English. 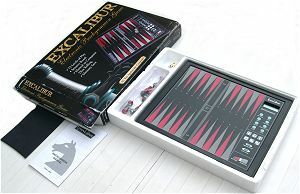 This Excalibur Electronic Backgammon had 366E as serial number. It included 72 game levels. I played at level 72 And the response time remained brief (some seconds). Later, Excalibur published another backgammon game with 366-E2 as serial number. It did not include the same software. For instance it had 8 levels. 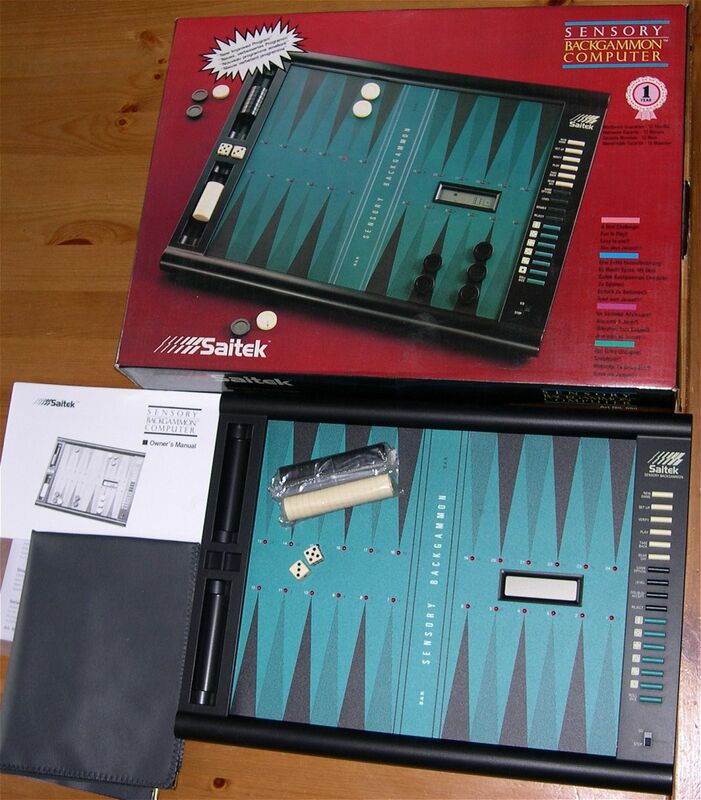 The Saitek Sensory Backgammon is from 1988. It's a 8K software with 9 game levels. It also plays the Jacquet, the Pasch dice game and the 5-man Backgammon. The movements are entered by pressing the board (sensory system). 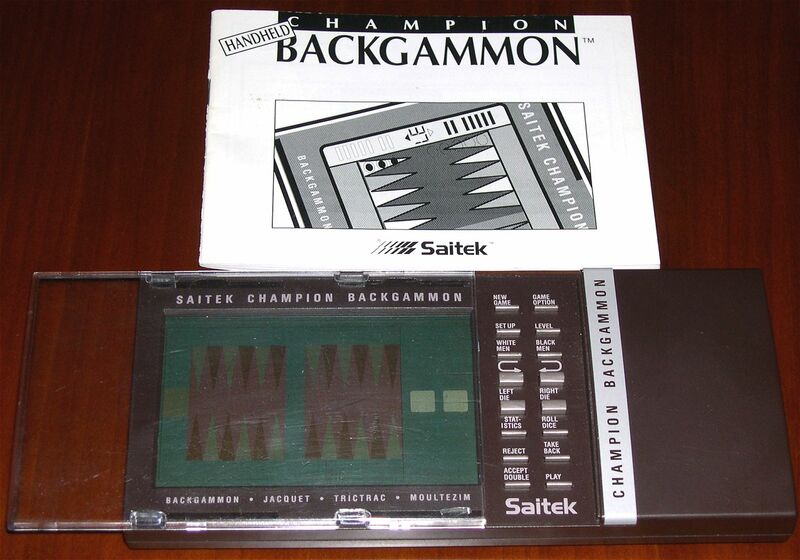 In 1989, Saitek produced the Electronic Champion backgammon with an improved 16K software but during a long time, both games remained together in the Saitek Catalogue. 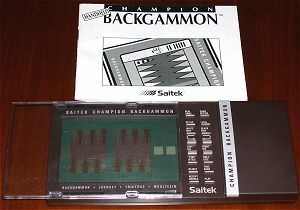 The Saitek Electronic Champion Backgammon is probably the best Backgammon dedicated computer ever published. 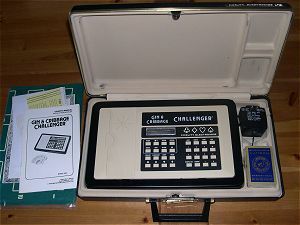 He won the Computer Olympiad de 1989 against its competitors. However, for the good players, he play a very weak game even if the one they prefer. 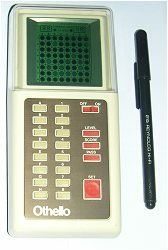 It's a sophisticated programme that runs on a microprocessor Hitachi 6301Y with 16Ko of ROM. it plays different variants: the Jacquet (France), the Tric Trac (France, XVIIth et XVIIIth century), the Moultezim (Turkey) and the Plakoto (Greece). The Saitek Handheld Champion Backgammon was the travel design of the Saitek Champion Electronic Backgammon. The Game used a large LCD screen. The processor speed was indicated in the user manual. It was quite low: 1MHz. 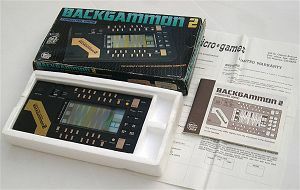 The "Backgammon 2" is a game made in Japan for the Californian company "Micro Games USA". It is a good quality game. It uses a 4Kb software on an 8 bits processor. The display is made on a good quality LCD screen. There are many options: 2 game levels (defensive and offensive), the use of real dice or electronic dice, a game with 2 players and so on. 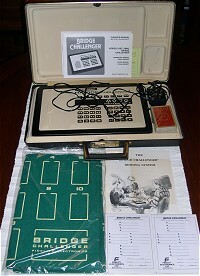 There are 2 game levels and in the the user guide you can read for level 2, "almost impossible to win" against the computer. Of course, this is not exactly true.